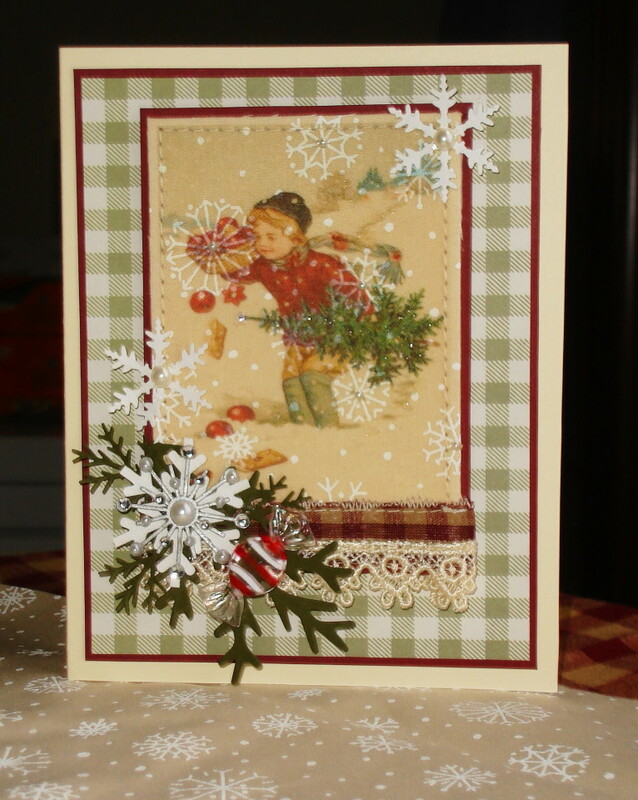 For this challenge, you have to use fabrics in any part of your card, either as a flower, a small embellishment, or whatever you want! We also want to see stitching, either faux stitching or machine stitching. Please specify where you used your fabric if it is not noticeable in the project, and above all have fun! This challenge closes at 11:59 p.m. Eastern Time on December 14th. For my card I used pre-printed cotton fabric (see below card for detail of snowflake print), witch I printed this vintage image onto. 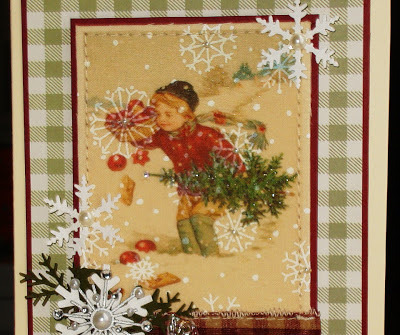 Cut it out and added matting, stitch around the edges and added gingham ribbon and lace witch was also stitched down. 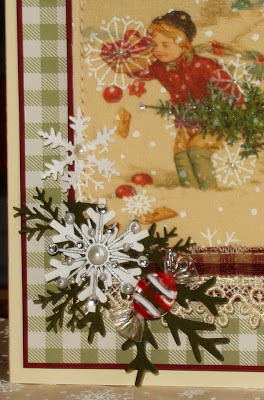 I used EK Success punch for snowflakes and Martha Steward for the large snowflake, then Tim Holtz for pine bough, and Martha Steward. we have some snow today, really makes it feel Christmassy out. You printed that image onto the fabric? Wow, how totally amazing! I love how you have used the fabric for this challenge! Love the gingham background too. Super entry into our fabric and stitching challenge, Vada! So happy to see you playing along with the challenges over at Our Creative Corner! Vada, this is great! Love the vintage feel and the pretty fabrics and stitching. 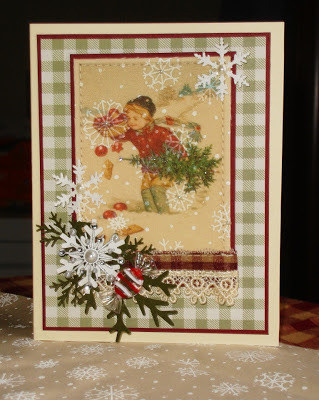 I've just begun stitching on cards this year, and there is nothing like it! BEAUTIFUL card! Has that old nostolgic feel to it. Bringing back memories of yesteryear!. Hope your having a wonderful Holiday season. How beautiful! Love the stitching and the way you've adorned the snowflakes. That image printed onto the fabric is absolutely amazing! You created a wonderful vintage look. Great take on the challenge. Thanks for playing along with us at OCC this week! Such a beautiful Christmas card, it has such a nice warm feel about it. Vada, I really have to pull out my sewing machine! You have inspired me, my dear friend! Love this Christmas card! Every detail is so perfect as always! How fun to have some snow and I hope you have some for Christmas! We do get some snow and one year we have such a nice covering! Hugs and I hope you are enjoying the week and ready for Santa!